We buy and sell used aesthetic lasers, used medical lasers, used ophthalmic lasers, used hair removal lasers, used vascular lasers and used wrinkle lasers. Used Cosmetic lasers and used aesthetic lasers. We provide used cosmetic laser repair, used cosmetic laser training and used cosmetic laser warranties. Medical lasers have become very common in the practice of Dermatology, Surgery, Plastic Surgery, Dentistry, Ophthalmics and s or Cosmetic Procedures. Light Amplification by Stimulated Emission of Radiation (LASER) produces an intense beam of light of an exact and narrow wavelength, with insignificant dispersion over a short distance. This property is utilized in dermatology to treat various skin disorders. When a laser beam is directed at the skin, it is absorbed by the water in naturally occurring pigments like melanin and hemoglobin. It is also absorbed by artificial pigments introduced by means of tattooing. Lasers cause very precise tissue destruction of the lesion in the light path, and does not affect the skin tissue in the surrounding area. 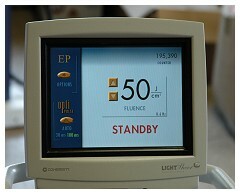 It is this precision that has generated tremendous interest among Dermatologists to use the laser as an operative tool. 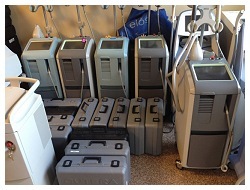 MedPro, Inc. - We Purchase Medical Lasers! MedPro, Inc. - Beautiful Refurbished Lasers! Port Wine Stains can be removed with the Pulsed Dye Laser (Vasculite) and Carbon Dioxide Laser. They require multiple sittings, but the results are very satisfying. Spider Nevi can be treated with the Pulsed Dye Laser and Long Pulsed Nd YAG Laser. Lesions on the face can be treated with the KTP laser. Warts, a viral infection caused by Human Papiloma virus are effectively removed by the Carbon Dioxide or Pulsed Dye Laser. Scars such as acne scars or ice pick scars are resurfaced with the Erbium YAG laser or Carbon Dioxide Laser. Hypertrophic scars are flattened with the Pulsed Dye Laser. Moles and Nevi are removed for medical or cosmetic reasons using the Carbon Dioxide, Ruby or Erbium YAG Laser depending on the type. Pulsed Dye Lasers are also used to treat "Giant Pigmented Nevi.". Lentigenes (age spots) are removed using Ruby Lasers. Hair Removal temporary or long term has become a much easier task with the advent of lasers. Largely, laser hair removal gives excellent results in fair skinned people. Listed below are a few lasers used for hair removal. GentLASE (long pulsed Alexandrite laser) preferred for dark hair in light skinned. Lyra (long pulsed YAG) for dark skinned people. The laser light is absorbed by hair follicles, and spares other skin appendages. Cooling devices further prevent heat damage to the rest of the skin. Laser hair removal needs multiple sessions. Regrowth of hair after each session may take from 3 months to up to a year. The regrowth is thinner, slower and scantier after each session. Resurfacing is done effectively using lasers for acne scars, pits and small pox scars. Wrinkles are also treated by this technique. This procedure involves the precise removal of very thin layers of irregular skin. Carbon Dioxide Lasers and Erbium YAG Lasers are used for laser ablation. Q - switched Nd YAG lasers are used for non-ablative resurfacing. Tattoo Removal - tattoos are difficult to treat. Q-Switched Ruby Lasers and Nd YAG Lasers are effective. Multiple sessions over many months may be required to obtain favorable results. The color of the tattoo and the depth of the pigment influence the duration and the outcome of the laser treatment. There are many kinds of lasers available today. Each of them have a specific range of utility, depending on their wavelength and penetration. Some commonly used lasers are listed below.